An unlikely group of characters face fear on a doomed flight, with William Shatner acting his socks off. So as Halloween is upon us, so what better way to celebrate it with one of the more infamous 1970s Made for TV horror movies, The Horror At 37,000 Feet (1973). As you know I love movies with ensemble casts and headed by at least one major star (unless you are lucky enough to recognise their supporting cast). It was made all the more delightful here with the acting talents of William Shatner, the only actor I recognised from the cast. Darlin’ Husband however recognised Roy Thinnes as O’Neill star of The Invaders (1967-68) and . However like National Lampoon’s Christmas Vacation (1989) on a closer look through the supporting cast’s filmographies – and the input from my Darlin’ Husband – it appears this movie starred a cast from more familiar films and television from this time including movies such as Soylent Green (1973) and The Beguiled (1973). The cast also appeared in sci-fi TV – Trekkies will recognise some others in this cast – and as guest stars from well-known classic 1970s TV series such as The Love Boat (1977-87) and Magnum P.I. (1980-88). As the film starts, we meet the different characters of the film checking into a flight leaving from London to New York, learning a little on their background stories. We all too briefly see Shatner’s character, who we meet properly later when he is introduced as Paul Kovalik. The characters include an architect Alan O’Neill (Thinnes) – who is moving part of an altar from abbey from his wife’s English ancestral home – his bickering wife Sheila (Jane Merrow) and Mrs Pinder (Tammy Grimes) and her dog (why?). Pinder who recently challenged the O’Neill’s in court about this in an English court and lost. This information does give you more than a wee sense of foreboding, especially if you have watched too many horror TV movies. Or it may make you sit back with a stiff drink and observe everything with an air of ambivalence and cynicism, which is what Kovalik does with the other passengers in the first half of the movie. Other characters are a millionaire, Kovalik’s often wide-eyed female companion Manya, complete with guitar – who I first thought was Mia Farrow but wasn’t – a child and her doll, a model, a doctor, a defrocked priest and a cowboy singer. I’ll let you watch it to find out which applies to Mr Shatner. These appearing to be the only people on the plane, a 747 on two floors. Some of the characters and items listed will be important in this film. And some thankfully not. You almost expect to see Peter Ustinov to turn up as Hercule Poirot or an early appearance by Angela Lansbury as Jessica Fletcher. Just before the plane takes off, a cold chill is felt in the air with some rather daft special effects – such as frosted glass, a skirt blows up and a cast member sneezing – and script to reinforce this. The two air hostesses – clad in a cross between 1970s air hostess trolley dolly and colonial hats provided by the set of Zulu (1964) – give instructions on what do should something go wrong on the flight. Which you know it will if you read the film’s title, you’d know it’s doomed. In the hold, a banging is heard with a strange movements from the architect’s packages. You may pour yourself another drink at this time, as Kovalik apparently character is, as his character slowly gets drunk. This film is a guilty pleasure to watch, but quite fun too despite many sites stating it is probably one of Shatner’s worse movies. Shatner is brilliantly overexaggerates his character and his talents do not go unwasted. He acts with his facial expressions alone for much of the first half of this movie. The second half he gets even more expressive facial expressions and more lines, which is a relief as many will tune in for Shatner’s performance alone. His supporting cast all act in various ways from being too calm and collected, to unhinged, to frightened. Manya gives regular updates on the action when the plot continues – which was useful as the plot became more than a bit silly. The reasons for the Horror are explained by one particular character are clichéd and tropes and you wonder why this character took this flight if they knew, or at least told the crew before take off about her concerns. Shatner however continues to be excellent as he hams up the lines, acting and facial expressions as his character leads us into the final more humorous terrifying, unknown scenes. However your don’t know whether to be frightened for him or reassured after all this is the man who as Kirk in many a Star Trek appearance faced many dangerous characters. This ending scenes are more than a bit bizarre with the last scene a bit of an annoyance as the terror is confronted. But in the end – like cast member Russell Johnson as the millionaire must have been relieved on reading his script – you are that it was not a fellow character’s nightmare, as it would be for Johnson when he was cast as a sheriff in Pam Ewing’s Dallas dream season. Bonus Trailer: Yes, a clip with Shatner, SPOILERS!!! 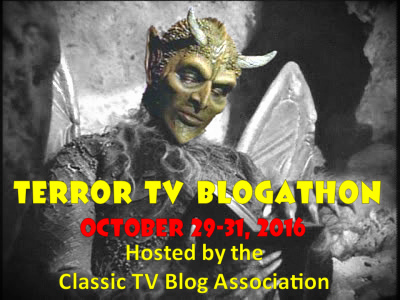 This review has been entered in the Terror TV Blogathon run by the Classic TV Blog Association. You can click here to read the other fabulous entries. Other reviews with this cast include William Shatner who starred in Star Trek VI: The Undiscovered Country and Russell Johnson who appeared in Dallas. Roy Thinnes also starred in Hotel and The Love Boat both reviewed HERE. it’s goofy and cheesy by today’s standards, no doubt. But there is still something deeply unsettling about the story. It is still an effective little chiller. I do love these 70s horror films, much more than todays fare and as you say it is a great wee movie. Yes, Bill Shatner does act his socks off! Really, what can you about a movie with Chuck Connors, Buddy Ebsen, Roy Thinnes, Paul Winfield,…and William Shatner. Yes, it’s silly (I love it when at one point, Connors’ pilot copes with the situation by telling the stewardesses to offer free alcoholic beverages!). But, as you point out, that doesn’t mean it’s not entertaining. A great pick for the Terror TV Blogathon. One of the greatest of the goofy scary TV Movies with a splendid cast of TV favorites! What more could you ask for? Good choice! & thanks for the memories! A hilarious review. I love watching Shatner. You nailed it when you said he “brilliantly overexexaggerates his character.” I wish Peter Ustinov as Hercule Poirot was in this movie. Maybe that horrible ending could have been avoided. That lady in the trailer (Tammy Crimes?) reminds me of Melanie Griffith….